A composer from Ealing who was commissioned to write a score for the 90th anniversary of the Battle of The Somme will hear Ealing Symphony Orchestra play it live. The Battle of the Somme remains one of the most successful British films ever made. It is estimated over 20 million tickets were sold in Great Britain in the first two months of release, and the film was distributed world-wide to demonstrate to allies and neutrals Britain’s commitment to the First World War. It is the source of many of that conflict’s most iconic images. It was made by British official cinematographers Geoffrey Malins and John McDowell. Though it was not intended as a feature film, once the volume and quality of their footage had been seen in London, the British Topical Committee for War Films decided to compile a feature-length film. 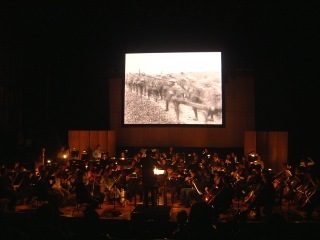 Laura Rossi’s new score was commissioned in 2006 to mark the 90th anniversary of The Battle of the Somme as a soundtrack for the newly-released digitally restored film. When embarking on her research on the film and the battle in preparation for her composition, Laura discovered her great uncle, Fred Ainge, (whom she knew as he survived the war) was a stretcher-bearer attached to the 29th Division on 1 July 1916. In preparation for composing the new score she visited the Somme Battlefields, using Fred’s diaries to locate the areas in which he served. The re-mastered film was screened for the 90th anniversary of the Battle to a full house at the Queen Elizabeth Hall with the premiere of Laura's orchestral score, performed by the Philharmonia Orchestra and received a glowing 5 star review in The Times. Its first performance by the Philharmonia in a sold-out Queen Elizabeth Hall and received a five-star review in The Times, and the tour performances have been selling out too. events. Before the performance there will be an illustrated talk by Laura herself and Dr Toby Haggith of the Imperial War Museum, when questions can be asked. There will then be a short break before the film, which runs for 75 minutes. There's more about it on Laura's website at www.laurarossi.com . The CD is available to purchase from www.virtuosarecords.co.uk and the CD booklet includes extracts from Laura’s great uncle Fred’s diaries including the first days of the Somme battle from July 1st 1916.